In the first version of this new Linear B keyboard, which I posted this summer, I made an egregious error. The Linear B syllabogram produced when you type UC Y is QA, and the logogram PHU, as once bellieved. It is absolutely essential you understand this. QA is in fact a syllabogram. The first thing I would like to point out is that it took me no less than 4 hours (!) 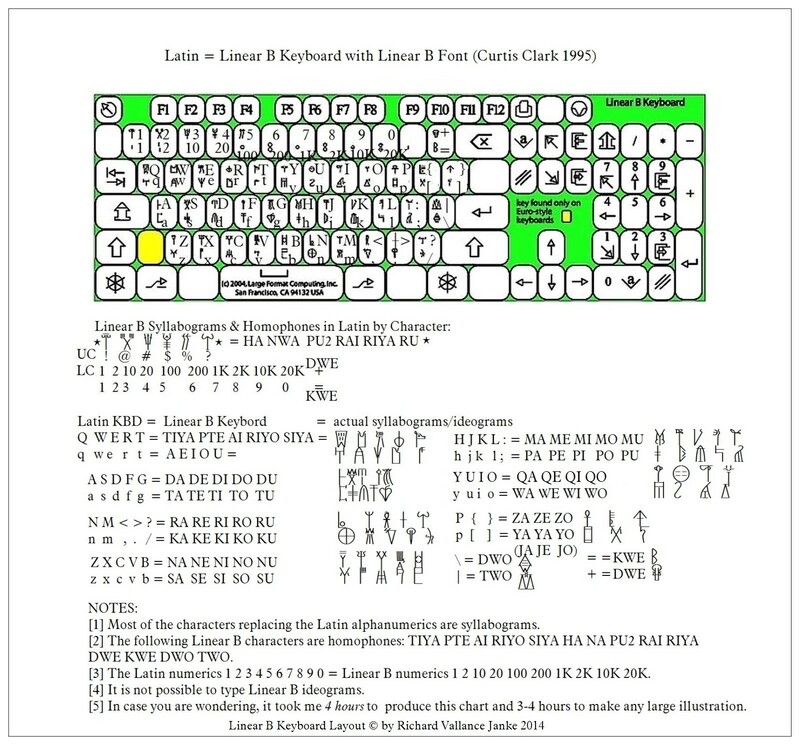 of meticulous work to produce this fine chart of the Latin to Linear B Keyboard, just as it takes me between 1 g and 5 (!) hours to produce all the high quality Linear B tablet & fragment translations, illustrations etc. I work very hard on our blog to make sure that all illustrations for all posts are as clear and informative as possible. Most of the illustrations of Linear B tablets and fragments, and most of the rest of Linear B varia on the Internet are frequently of poor or fair quality at best, although plenty of them are of at least good quality, or even excellent. But good is never enough for me, because I want to make certain that any and all students, translators and researchers in Linear B have access to the highest possible quality illustrations for Mycenaean Greek & Linear B. That is why I scanned well over 3,000 Linear B tablets and fragments in Scripta Minoa, sharpened them, converted them to clear B&W and blew them up so that the Linear B characters would be very easy to read. I do sincerely hope people really appreciate the work I put into illustrations and indeed the explanatory text in our posts, which often goes to great lengths to make sure that folks who visit us have the clearest possible idea of whatever topic we are dealing with. Suggestion: Feel free to download this chart, which is in .jpg format. You can then print it out and, to be sure it does not get all messy if you happen to pour coffee, tea or worse on it, laminate it and post it on the wall right behind your computer. This will expedite the learning process for the Linear B font. The next page features a complete explanation by Dr. Curtis Clark himself on how he came to create this fine font.